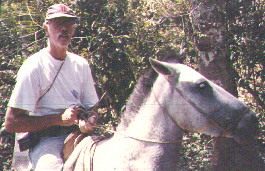 Al Twiss is the owner of Los Chancas Expeditions and guides Whitewater trips and River Expeditions. He is originally from Canton, Ohio and has lived for the past 16 years in the Peruvian Amazon. Iván Twiss was born in Los Angeles, California. Iván has spent most of his life in Peruvian Amazon. When not working as a river guide in California he guides our Whitewater Rafting and Kayak trips. Stéphanie Gallusser was born in Lausanne, Switzerland. She currently divides her time between teaching fellowship 5 months of the year at the University Neuchâtel in Switzerland and doing research for Doctoral thesis on butterflies in Tarapoto, Peru. Stéphanie speaks French, Spanish and English. Rainer Schulte is a German biologist, expert on reptiles and amphibians with two books published in German on the subject of Poison Dart Frogs of Peru and one to be published in 2,000 in English. He has lived in Peru for 16 years where he has discovered several previously unknown species of Poison Dart Frogs. Rainer speaks German, English, Spanish and French. Dionisio Santos, born in France of Spanish parents, is owner of YACUMAMAN E.I.R.L. and was a co-founder of TAKIWASI (Center for Rehabilitation for Drug Dependence and Investigation of Traditional Medicine) where he helped develop treatment program for drug dependence using dieting, Ayahuasca and other medicinal plants. Currently gives lectures and seminars in South America and Europe on traditional medicine and use of medicinal plants. Dionisio speaks French, Spanish and English.